↑ Bullfinch, Thomas. "Bulfinch Mythology – Age of Fable – Stories of Gods & Heroes". สืบค้นเมื่อ 2007-09-07. 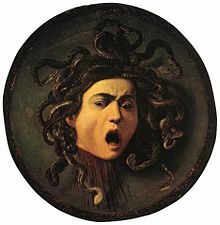 ...and turning his face away, he held up the Gorgon’s head. Atlas, with all his bulk, was changed into stone. หน้านี้แก้ไขล่าสุดเมื่อวันที่ 20 มกราคม 2562 เวลา 00:17 น.